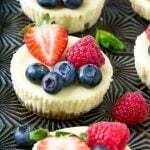 This recipe for Greek yogurt cheesecake is mini cheesecakes that have been lightened up with Greek yogurt and topped with fresh berries. A quick and easy sweet treat! I happen to love cheesecake, but I don’t love all the calories that come along with it. These little bite sized versions are made with Greek yogurt which means less guilt with plenty of great flavors. 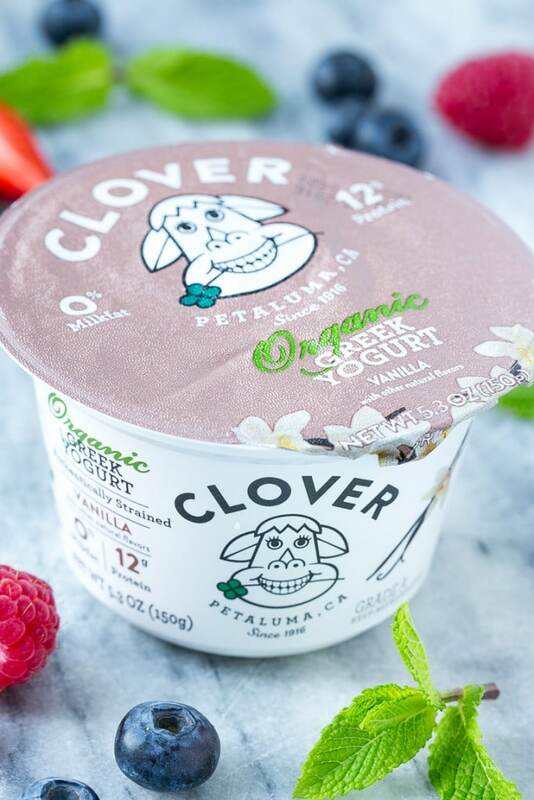 This post is sponsored by Clover Organic Greek Yogurt. Thank you for supporting the brands that make Dinner at the Zoo possible! I love cheesecake, but it’s too dangerous for me to have an entire cake in the house – I might eat the whole thing! I came up with this recipe for Greek yogurt cheesecake to satisfy my cheesecake cravings in bite sized form. These cheesecakes can be assembled in minutes and are the perfect make-ahead dessert for when you want a little sweet treat. My secret ingredient in this recipe is Clover Vanilla Organic Greek Yogurt. The yogurt gives these cheesecakes a lighter texture and adds a lot of flavor, plus each cup contains 12 grams of protein. How do you make Greek yogurt cheesecake? These Greek yogurt cheesecakes start with a simple graham cracker crust. The crust is pressed into cupcake liners and a 5 ingredient cheesecake filling is poured over the top. After 25 minutes in the oven, you’ve got dessert perfection! You can top these cheesecakes with whatever fruit you like, a drizzle of chocolate sauce would also be a nice addition. I went with fresh berries because we always have them around now that they’re back in season. After you chill these little cakes, it’s easy to unmold them from the cupcake papers. My whole family loves these treats, I make them a few times a month! I’ve included a video with step-by-step instructions on how you can make your own mini Greek yogurt cheesecakes. 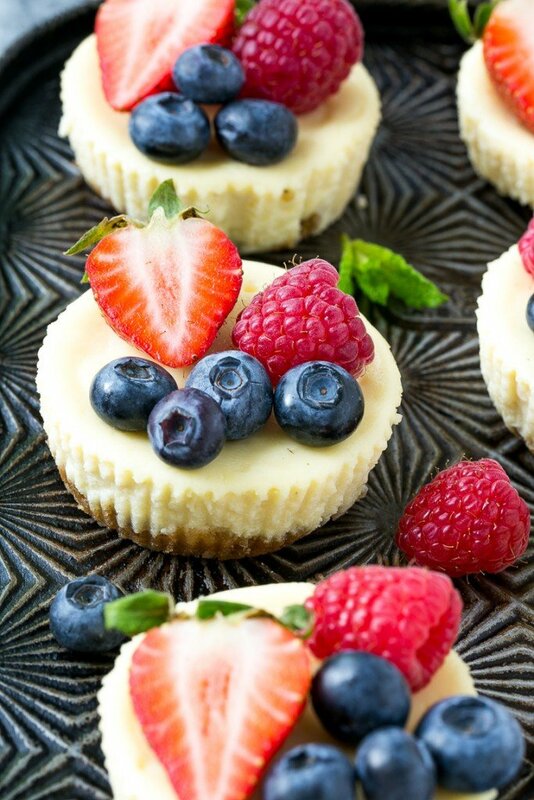 Whether you’re feeding a crowd or simply looking for an everyday sweet snack, these cheesecakes are sure to get rave reviews! 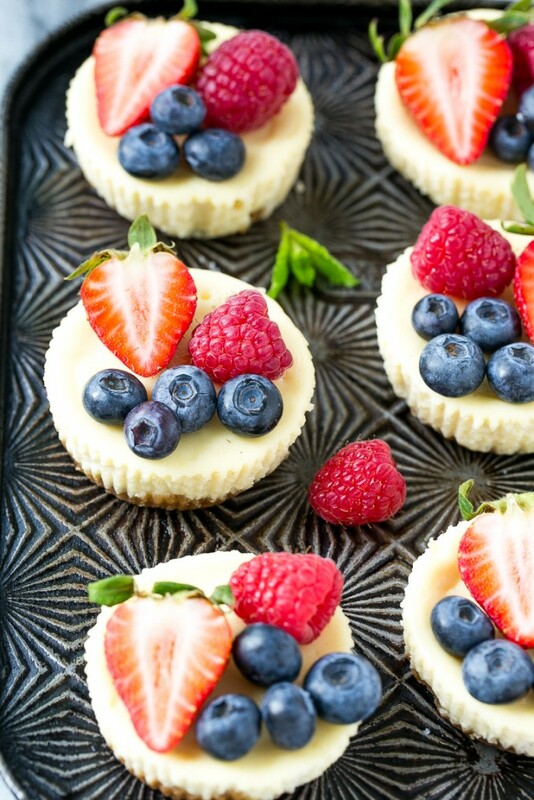 This recipe for Greek yogurt cheesecakes is mini cheesecakes that have been lightened up with Greek yogurt and topped with fresh berries. A quick and easy sweet treat! Preheat the oven to 350 degrees. Line a muffin tin with 6 paper liners. In a small bowl mix together the graham cracker crumbs, butter and sugar until thoroughly combined. Spoon one tablespoon of the graham cracker mixture into each liner and press down to flatten. In a medium bowl, using a mixer or a whisk, beat the cream cheese until very smooth, 2-3 minutes. Add the Greek yogurt, sugar, egg and vanilla extract, beat 1-2 minutes to combine. Pour the cheesecake filling evenly over the crusts. Bake for 25 minutes or until centers are set. Remove from oven and cool at room temperature for 20 minutes. Transfer to the refrigerator and chill for at least 2 hours. 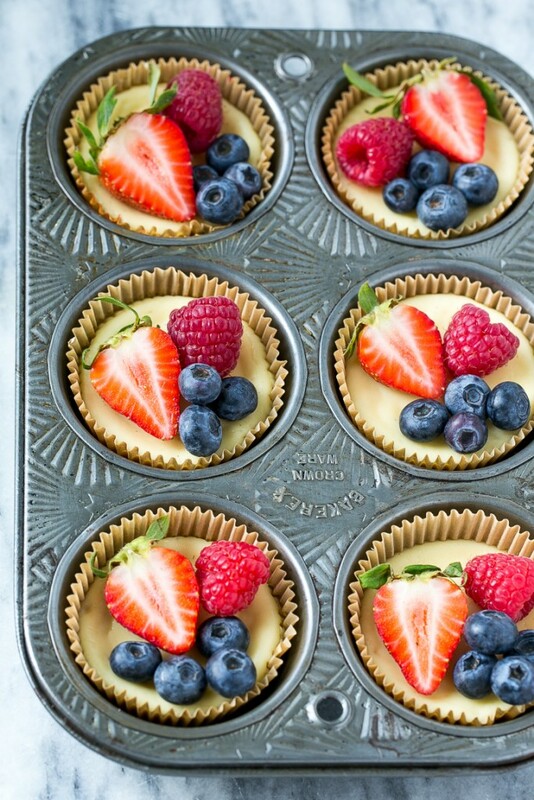 Remove paper liners and top the cheesecakes with berries. Serve immediately. 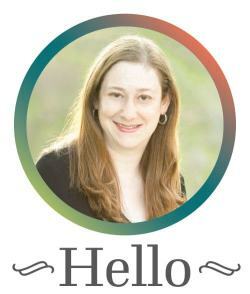 Hello ! I was wondering what can I use instead of egg. What a great idea! Greek yogurt cheesecakes sound like a lot of fun. I love the individual mini cheesecakes! Your post brought back memories of my mother’s mini cheesecakes. Of course, hers were very simple and not decorated with the fruit…they look delicious. These are so cute! I love that they are a lighter treat thanks to the greek yogurt. These are beautiful and sound delicious. I love that they have lots of protein too! A win-win-win! I can imagine taking a bite of these right now! How cute are these delicious treats. I bet your kids gobbled them up in no time. Great recipe, Sara! These are utterly adorable, and the fact that they’re healthy is just the icing on the (cheese)cake! Hi Sara, first of all I love your vintage pan, so nice. Anyway, love how you lightened these up, just in time for summer. Beautiful presentation. Could you use Stevia instead of sugar and sugar free vanilla wafers for the crust?